I was making my usual Saturday resale shop circulation two weeks ago when I found these Kent Coffey Tableau dressers at a local thrift shop for basically nothing. This shop doesn't typically carry ant furniture so I was extremely surprised to see them there. 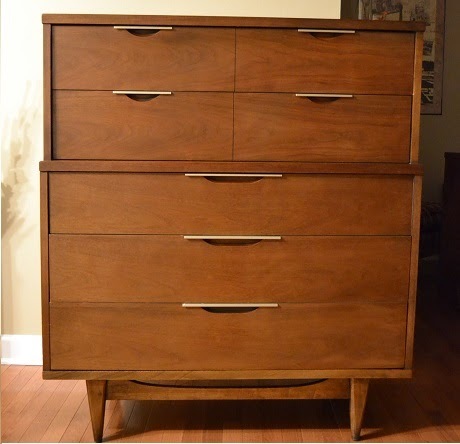 The highboy is a good shape and only had a slight chip in the walnut veneer on one side. The low dresser needs a bit more work but I think for the price, the work is completely doable. 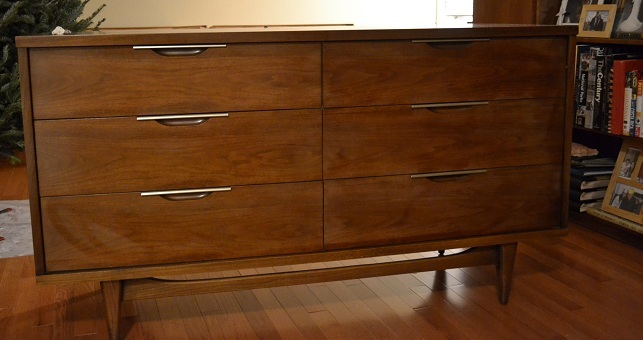 We are going to be putting these in our room for now replacing some oak dressers we currently have/dislike. Hopefully the low dresser will clean up nice and in the future, they can be for child #2! Love the set. I really like the metal accents and those legs. Kent Coffey makes some amazing stuff. Those are beautiful pieces! What a lucky find. Your sweet baby sleeping in the cradle is precious. Seems like yesterday I was rocking my youngest in a cradle. He's 19 now. Time flies. Enjoy every last moment. Wonderful Kent-Coffey pieces! And that cradle is fantastic. Enjoy your sweet boy. My grandsons are 1 and 2. It seems like just the other day they were that small!